Set global default settings for new users, as well as general settings related to B2B Marketplace. 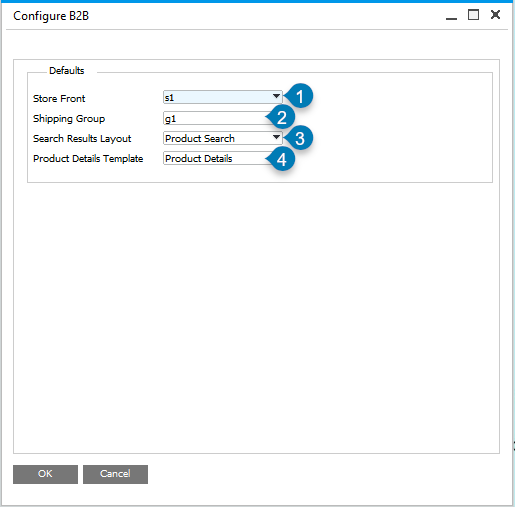 To access Global Config, open the B2B Configuration screen in SAP Business One: InterConnect Manager AddOn > Customer Portal B2B > Global Config. Set each default option. Overrides may be applied to individual users. Store Front (1) Set the default layout loaded by users who log into the site. Set the default shipping group for users. Individual users may be assigned to a specific shipping group to override this setting. See Business Partner Configuration for instructions. Set the default layout for search results. This setting can be overridden for each Store Front. See Store Front Management for instructions. Set the default layout template for the product details page. This setting can be overridden for each Web Product. See the Administrator’s Guide to B2B Marketplace: Web Product Details Configuration for instructions.